BOSTON - Friday, December 8, 2017 - Mayor Martin J. Walsh and the Mayor's Office of Arts and Culture, in collaboration with the Mayor's Office of Immigrant Advancement and the East Boston Greenway Council, today announced a mural honoring immigrant grandmothers has been completed in East Boston. The mural, painted by the Mayor's Mural Crew Director Heidi Schork and three assistants, was the third installment of murals dedicated to immigrants in Boston. It was spearheaded by the Mayor's Office for Immigrant Advancement as part of the national letter writing and social media campaign, "To Immigrants with Love". "Immigrants are an integral part of our city, and it's their hard work, dedication and sacrifices that have made Boston the great city it is today," said Mayor Walsh. "I'm so proud to be able to honor them in this way, and I hope that this incredible work inspires other cities to do the same." An unveiling ceremony was held on Friday in collaboration with the East Boston Greenway Council. Mural subjects and family members gathered to stories about their grandmothers, and their ties to East Boston. State Representative of East Boston Adrian Madaro, along with Director of Mayor's Office for Immigrant Advancement Alejandra St. Guillen, President of East Boston Greenway Council Karen Maddalena, and Director of Mayor's Mural Crew Heidi Schork also spoke about the process and the importance of the mural's location. 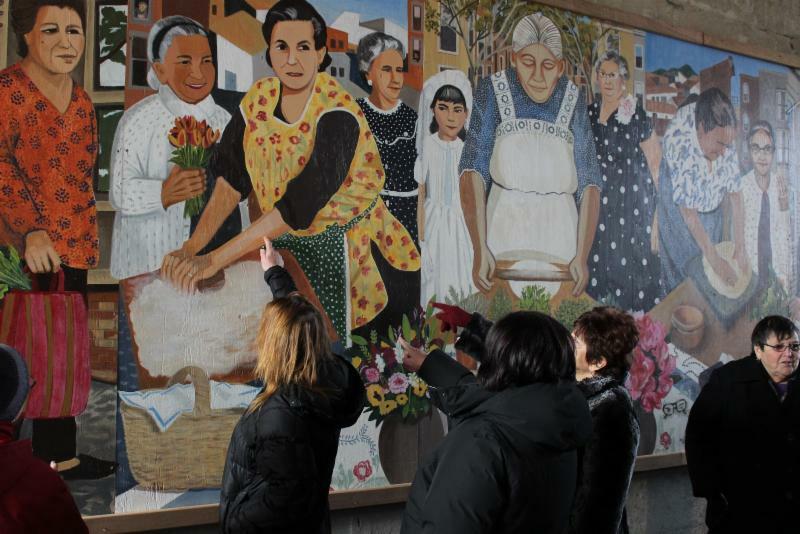 "This mural is a wonderful tribute to the immigrant history of East Boston, and it highlights some wonderful family stories of immigrant families from different backgrounds," said Mary Ellen Welch, a founding member of the East Boston Greenway Council. "The families were delighted to share the stories of their immigrant histories." The first two murals painted as part of the "To Immigrants with Love" campaign were located in Roslindale and East Boston, and featured local immigrants who were business people, entrepreneurs, and community activists, and whose work helped shape the surrounding areas into what they are today. "This campaign showcases how immigration has been and continues to be embedded in the fabric of our city," said Alejandra St. Guillen, Director of the Mayor's Office for Immigrant Advancement. 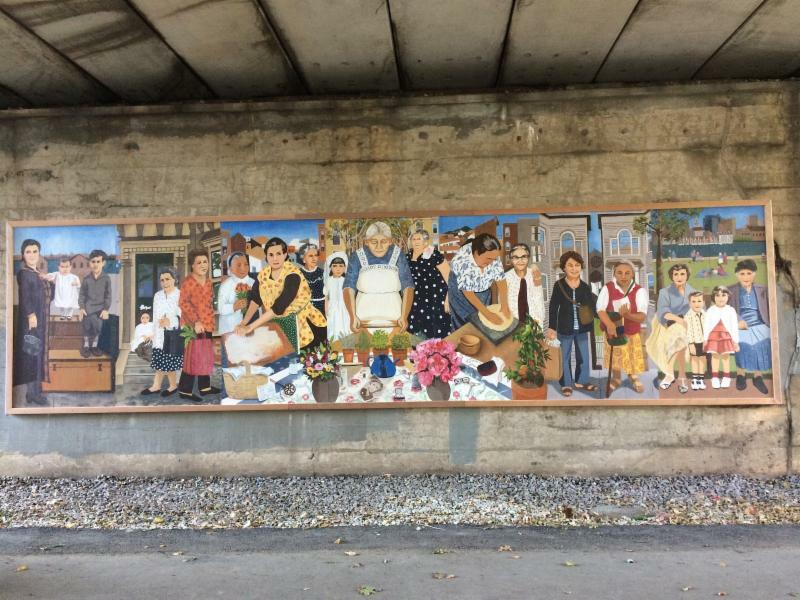 "The families and stories highlighted on this mural have an intrinsic commonality that people from all backgrounds and origins can connect with." The idea for the third mural came as Schork was painting the first mural in East Boston. She noticed an abundance of elderly women in the area, and decided to paint a mural dedicated solely to East Boston grandmothers. Local residents were asked to submit photos of their grandmothers for the project, and many of them made it into the mural's design. Several art workshops were also held in East Boston earlier this fall, where people brought in objects that belonged to their ancestors, such as rosary beads, jewelry, and old keys. Many of those objects informed the Mural Crews' work as they were painting. Diane Barsotti submitted photos of her maternal and paternal grandmothers, and both were featured in the mural. Her maternal grandmother, whom her and her siblings referred to as "Nonni American", because she was the first of the grandmothers to immigrate to the United States, is depicted wearing an apron and making pasta. Her paternal grandmother, "Nonni Italy" is depicted in a passport photo on the table. "They would walk over this bridge almost every day, on their way to work, or shopping for groceries, or sometimes even visiting each other," Barsotti said. "And they learned the streets of the little part of the city as they knew the streets of Italy. So when we found out about the mural being depicted we submitted the photographs, and we were just so honored to find out that they would be part of it. This is an amazing thing that the Mayor's Office is doing, it's just incredible." "This mural highlights a message that is a vital goal of Boston Creates -- to create a city where all cultures are represented and treated equally," said Julie Burros, Chief of Arts and Culture. "When it comes to shaping Boston's history, no one group of immigrants was more influential than the other, and this does an excellent job of showing that we all have more in common with each other than we think." The mural is comprised of seven panels, and it measures 28 feet long by seven feet high. It is located on the East Boston Greenway under the Sumner Street overpass at the intersection of Sumner and Bremer Streets. The Mayor's Office of Arts and Culture's mission is to support artists, the cultural sector, and to promote access to the arts for all. The office houses the Boston Cultural Council, the Boston Art Commission, and the Poet Laureate program. Responsibilities include implementing the City's cultural plan, Boston Creates; commissioning public art, managing the Boston Artist-in-Residence program; curating exhibitions in City Hall; and operating the historic Strand Theater in Dorchester. For more information, visit here. The Mayor's Office for Immigrant Advancement works to ensure the full participation of immigrants within the civic, economic, social and cultural life of Boston. Every year, MOIA assists over 2,000 residents by connecting them to English language classes, helping them obtain citizenship application assistance, facilitating access to city services, and providing accurate information about immigration laws, which helps immigrants contribute socially and economically to the city. For more information, please visit here. "My maternal grandmother is wearing the yellow apron, and she's making homemade ravioli, which she did almost every Sunday for us while we were growing up. And the entire family would congregate at her house in a small, tiny apartment on Everett St. in East Boston. And we would have her pasta and her gravy, which were outstanding. And my paternal grandmother's passport photo is depicted on the table, so my grandmother making the ravioli immigrated to the United States first of the two. So to distinguish between the two grandmothers we would call her Nonni American, and my grandmother that was living in Italy, we would call her Nonni Italy. But they settled in East Boston and they became so familiar with the area that they never left. They would walk over this bridge almost every day, on their way to work, or shopping for groceries, or sometimes even visiting each other. And they learned the streets of the little part of the city as they knew the streets of Italy. And they would talk about going places and so when we found out about the mural being depicted we submitted the photographs, and we were just so honored to find out that they would be part of it. This is an amazing thing that the Mayor's Office is doing, it's just incredible."